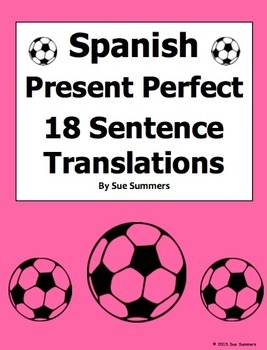 Spanish Present Perfect 18 Sentence Translations and Image IDs - Students translate 18 English to Spanish present perfect sentences with regular and irregular verbs. Sample verbs are escribir, romper, toucher, dar, freír, dormir, and poner. The majority of the sentences also include an adverb of time such as hoy, esta mañana, esta tarde, or esta noche. Students are also instructed to write a Spanish vocabulary word under each of the 6 clip art images. 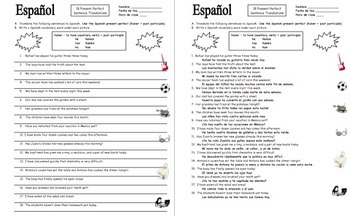 Please click here to see more of my Spanish present perfect materials. Please click here to see more of my Spanish adverbs materials.